The kit debate continues. 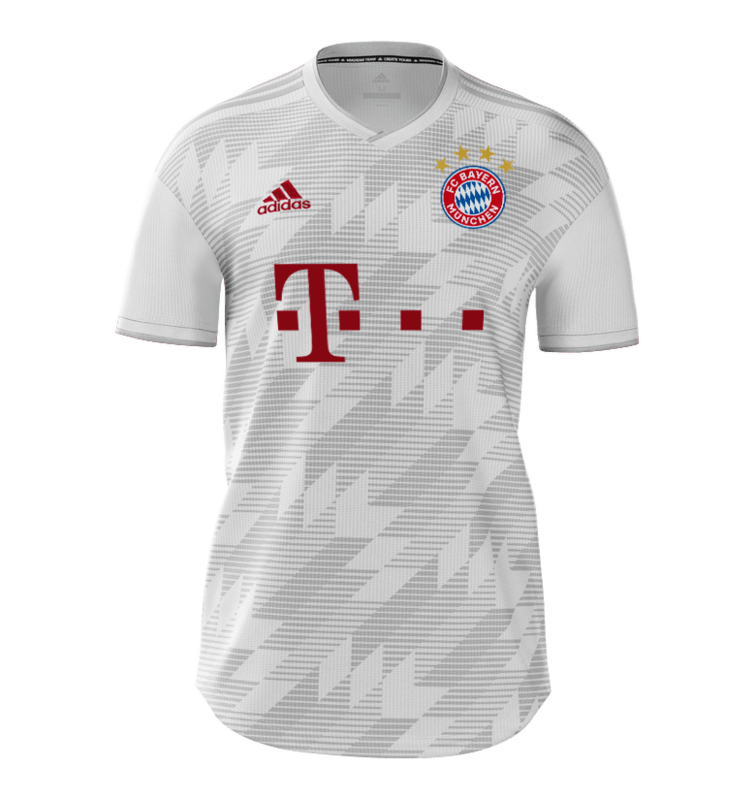 Following on from my earlier comments on the new away Trikot and growing complaints from Bayern fans about club colours, we see how things might look if us old school traditionalists got our way. In the previous edition of the Säbener Semmelscharrn, I discussed the creation of the fan group Paragraf Eins, and their demand for a return to the traditional colours of FC Bayern. Football today is more than just a sport, and football kits are a major part of a every club’s wider business model. Nobody is going to change this any time soon. The transformation of the football kit from a functional item of sportswear into a fashionable ensemble has had many benefits. Fans can keep up to date with the changing trends set on the pitch, and brighten up every match day simply by picking of many shirts hanging proudly in their wardrobe. As a collector of Bayern’s Trikot for close to thirty years, I know this feeling well. It is always interesting to see a new kit design. The fanfare, the leaks on the internet. The gossip. The debate among fans. But there is an argument that things are going too far. Three new kits every season. Colour schemes and garish designs that have no connection to any existing club tradition. Paragraf Eins have made their feelings known about Bayern’s latest designs. The blue home shorts. The mint-green and lilac away strip. Their desire to go back to the basics, and a return to the simplicity of red and white. I have touched on the new Auswärtstrikot right here on this blog. I do believe that the majority of FC Bayern fans, even those who are keen on pushing out the design boat, are in favour of having a red home shirt. Less concern has been shown to the away shirt. Even back in the early 1990s, Bayern were sporting that ugly egg yolk yellow monstrosity. Like many other old-school fans of Die Roten, I have always been in favour of a return to the good old white Auswärtstrikot. White, with mainly red trim. To be even more precise, an inversion of the home kit. The same design and style, but just flipped around. Think back to the 1980s and simple badgeless Commodore or Magirus-Deutz designs, sported by the likes of Kalle Rummenigge and Klaus Augenthaler. I decided to throw the idea out to kit designer and expert Jack Henderson, who turned out four excellent prototypes for a potential white FC Bayern Auswärtstrikot. All of them have a contemporary look, but hark back to the old school tradition. Simple, but stylish. Just how any kit should be. The plain white Trikot with minimal trim is simplicity itself. The overlapping V-neck takes us back to the 1980s; it is a classic, timeless design that has seen many reincarnations. This particular design has a slightly darker shade of red, more in tune with the Weinrot (“wine red”) referred to in the original charter of FC Bayern. 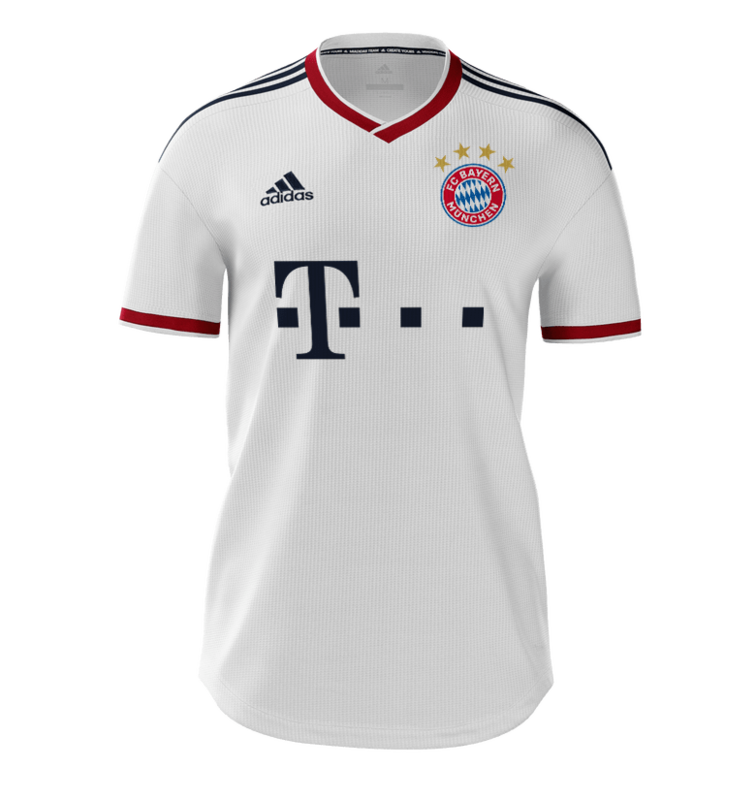 The stylishly traditional neck is complemented with matching cuffs, and the three Adidas stripes are taken from the blue in the FC Bayern badge. Naturally, the badge is as it should be, topped with the four gold champions’ stars. No monochrome madness here. Of course, we can go even further down the purist route and go for red stripes. Both the Adidas logo and the T-Com sponsor are in contrasting dark blue, which balances the shirt out perfectly. This second design has the look and feel of the current red Heimtrikot, but in reverse. The pattern is more in line with the green Germany away shirt worn at the 1990 World Cup, which was more recently give a retro reprise in 2017. To complement the modern-retro feel of the design, everything else on this Trikot is in red. The Adidas logo, the three stripes down the shoulders, and even the sponsor lettering. To provide an understated contrast, the simple V-neck is in white. With its modern look and traditional application of the red trim, this is a design that could please many Bayern fans. Just keep that infernal Qatar Airways sleeve patch as far away from it as possible! This sounds like a contradiction, but it is true. This third design has a far more modern look about it, but keeps the trim to a smart and simple minimum. There is a certain style and grace to it. The design is the same as that used on the current green Germany away shirt, composed of light shades of grey. The neck and cuffs are simple white, and the three Adidas stripes are in a gently contrasting pale grey. Of course, these could also be red. Apart from the standard club logo, the only flashes of colour can be found in the Adidas logo and sponsor. In traditional Weinrot, of course. This is a massively attractive design, a Trikot that stirs memories of great days in Munich. The 1980s have just called, and they want their kit back! According to designer Jack, this fourth white design is the throwback the team never got to wear. It has much the same general look as the first design – in fact, it is almost identical. The difference is in the additional design features, which make a gentle reference to the graphics of the late 1980s and early 1990s. Three stylised stripes in red and grey extend from the chest up to the armpit and shoulder, almost embracing the red T-Com sponsor logo. For Bayern fans with their fingers on the pulse, the design will be familiar. The team’s dark blue training shirts share this design, which is the same pattern as the black second shirts sported by the Argentinian national team during the recent World Cup. For some, tradition has to make way for the creativity. My friend Michel Munger has bought into this. We have discussed the Trikot topic quite a bit, and to no great surprise it turns out that he too has something to say on the subject. Perhaps the funniest thing is that his blog is called… Straight Red! So, where do you stand? If you like the old school white designs, which of the four designs do you like best? Or are you happy seeing Bayern playing in a bright fluorescent yellow or green Auswätstrikot? Please do share your share your comments below, and be sure to spread this around too. The more fans that get involved in the discussion, the better! You can follow Jack Henderson on Twitter at @hendocfc. Though just ignore the Chelski avatar.